Quick, name your favorite websites, the ones you visit every day without fail. (I mean, of course, after you visit In The Know.) I almost always start my day by checking in on Twitter. 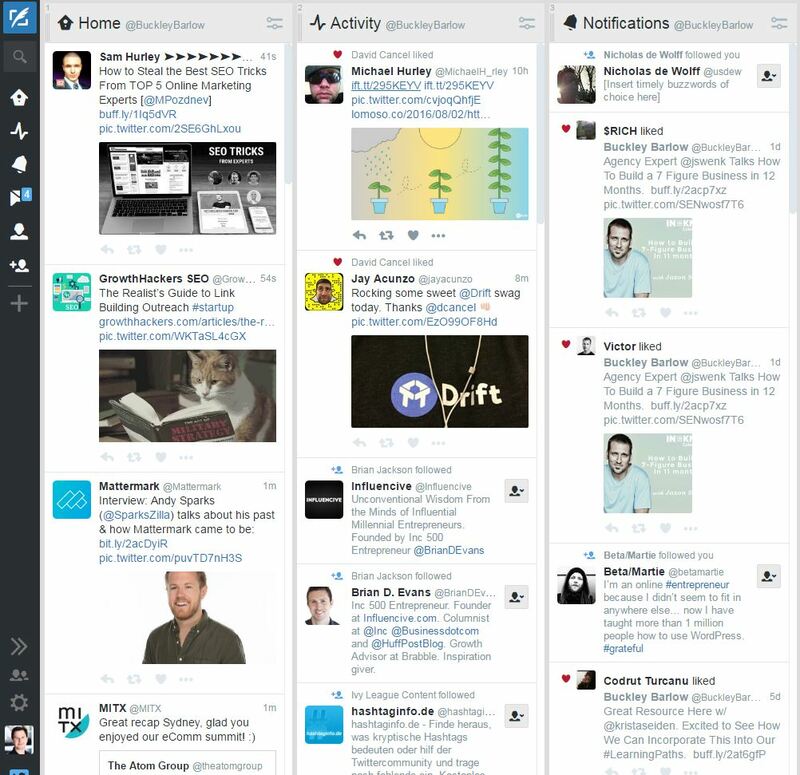 I get my Twitter alerts from TweetDeck (as seen below), an app which takes me out to all kinds of amazing content that I can get to quickly and efficiently. I also visit Huffington Post, which combines original content created for the site with curated, hand-picked articles that keep me constantly learning so that I can stay ahead of the curve. You might have also thought of at least one site that curates content in your field. And content curation is what I want to focus on today, because when it’s done right, curation is one of the most powerful content strategies available today – no matter what business you’re in. Content curation in the modern digital world is the art of combing through the vast amount of content available on the Internet, sifting out the gems that will interest a particular audience, and then investing time to create an attractive and meaningful presentation of that information. Scott Scanlon provides a fantastic video on the basics of content curation. It’s long – but it’s absolutely packed with useful information. Imagine you want to prepare a meal for your family. You go to the grocery store, which is full of food. You choose the items you know your family will enjoy, and then you come home. You don’t just toss the food, still wrapped up and in bags, onto the table for your family to sort out. Rather, you open packages, peel and chop vegetables, measure ingredients, sauté, bake, and grill as necessary. You do this with genuine enthusiasm, thinking about how your family will enjoy and appreciate the meal. (Unless you have teenagers. In which case, just order pizza and call it a day.) And when you serve the food, you take the time to make sure it looks nice on the plate, because you know how that adds to everyone’s overall enjoyment of the meal. Ok, I know, I know. The example is totally trite, but content curation is a lot like that. You bravely venture out into the wilds of the Web, go through pages and pages of worthless content to find the one or two gems (i.e. articles, videos, courses, etc.) that will truly provide value to your audience (some people say content curators are superheroes, and who I am to argue with those people?). Let’s break that down, because it’s not quite as simple as it sounds. Or, rather, it’s fairly simple – but it’s definitely not easy. Find all the content on a given topic. Review all the content that you found. Organize and present only the best of that content along with the context and value that only you can add. Simple, right? Are you starting to see why superhero is an apt description? Content curation, done well, is not easy, as Sean Bestor of SumoMe explains (even though his framework is a hugely handy tool and you really should visit his actionable link). Easy is compiling a list of 987 content marketing sites and publishing a list of URLs with a title like 987 Amazing Sites All Content Marketers Must Visit Right Now. No one has time to sift through that list of content. No one even wants to sift through that giant list to find the 23 sites that are actually useful. At its core, content curation is about adding value and a human connection, not doing simple content aggregation. Your job, as a content curator, is to do the work of separating the junk from the gems and only sharing the gems with your audience – and to provide the context and information that creates genuine value for your readers. The King of Curation, Robin Good, warns curators they should never share anything they haven’t read in full. If you apply Robin Good’s advice to that super-amazing-link-juicy-list of 987 sites, you’ll understand that you need to go through each one to find the 23 that your reader has an actual chance of using, and then you organize those in a meaningful way and you explain why each one deserves its spot on your list – what, specifically, your audience will gain by clicking over. You might describe how you found it in the first place or provide a detailed explanation of what sets these particular sites apart from the many others that didn’t make the cut. You could arrange your curated content thematically, or find some other way to make it easy and intuitive for others to search through it to retrieve the information that is most valuable to them. Without that context, that value, you’re not a content curator. At best, you’re a content aggregator, and over time, your users will recognize that your “recommendations” carry very little weight. When you retweet someone else’s content, Twitter offers you the ability to add a comment (see the yellow highlight below). There’s a reason you should take advantage of that opportunity: Your comment gives context, which is the underlying driver of connectedness. Without that context, you’re not really contributing any value to the conversation. But when you take the time to explain your position – even with the limited character count Twitter offers – you provide insight and value for your readers. If you simply retweet, repost, reblog, or re-whatever others’ links all the livelong day, it’s true that you’ll be maintaining an active social media presence, but you probably won’t see much engagement. Sure, your followers might click through the first few times, but they’ll soon realize that you’re just copying and pasting without any real rhyme or reason. Instead, tell people why you’re sharing this particular link – and be selective. Not everything deserves to be shared: Jessica Davis has some helpful pointers on how to curate for social media successfully. Find the truly valuable nuggets you can be proud to pass on to your audience, and leave the dregs to sink to the fourth page of Google, never to be seen again. 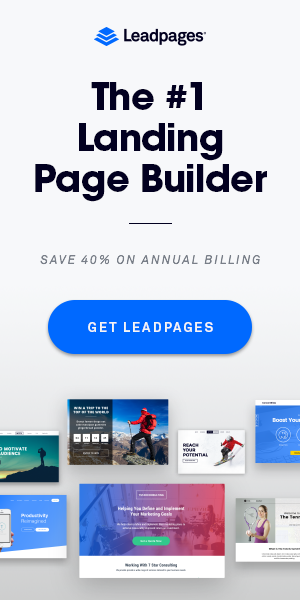 The way to your users’ hearts is through creating an amazing buyer experience throughout your modern marketing funnel. To do that, you need to always, always, always have your ideal customer in mind. When you write content, write to your ideal customer. 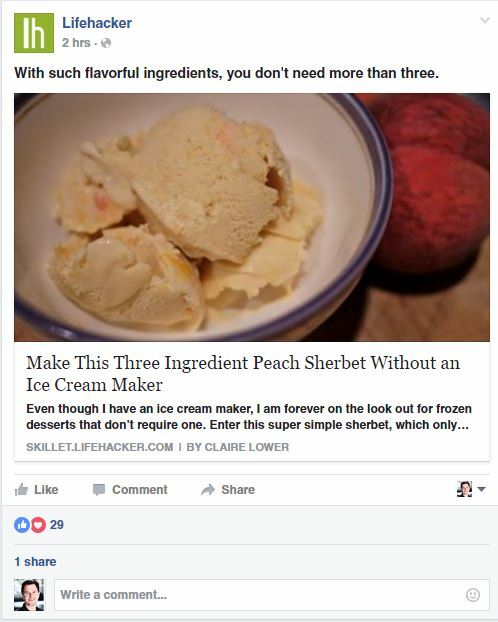 When you share content, share things that matter to your ideal customer – and don’t share things your ideal customer has most likely already seen, either via the original post or through the 73 other similar sites that have already shared it. Instead, try to find and share useful information people haven’t already seen. For example, I often share information that I find on David Skok’s forentrepreneurs.com because I know that it interests my audience, but that they might not have the time or desire to read everything David publishes. David is a successful entrepreneur turned VC who understands the hurdles entrepreneurs and small business owners face and I appreciate and respect his work. He knows which levers to push and pull to gain traction and growth and he’s obviously in the mix – as a vital resource – when it comes to scaling a venture. My readers rely on me to share – and analyze – that kind of relevant information that can absolutely affect and impact their businesses. 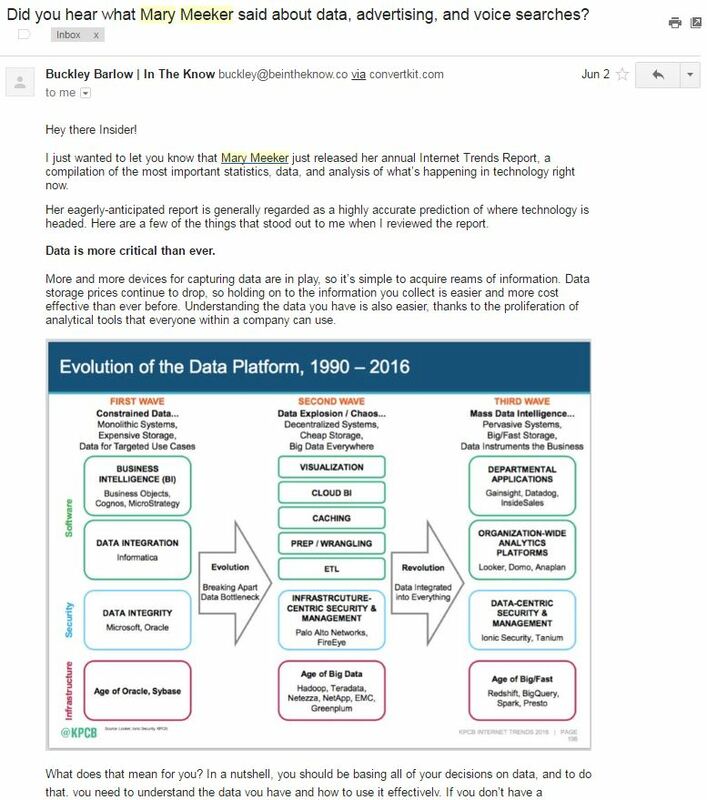 For example, when Mary Meeker published her annual Internet Trends Report, I knew that the information in her report – a compilation of the most important statistics, data, and analysis of what’s happening in technology right now – was important to Insiders, but I also recognize that most of my readers don’t have time to go through 213 slides. So I read it all for them, and then I sent out an email (seen below) to my list of subscribers (yeah, you ought to join my list) which detailed the most important points for Insiders to know. Content curation means providing Insiders with the best, most valuable information I can find, along with the necessary context. If value is what you’re after – and it should be – you need to ensure that you’re sharing new and timely information. Here’s a hint: if you read it on Buzzfeed, chances are good that your audience has seen it already. That’s why you need to find and share information from more niche sources. Go deep into the sites written by the real experts in and tangentially related to your industry, and skip the sites everyone’s already tapped into. If you’ve looked at our new curated learning paths, you can see that one name jumps out fairly often: Brian Balfour of Coelevate.com. 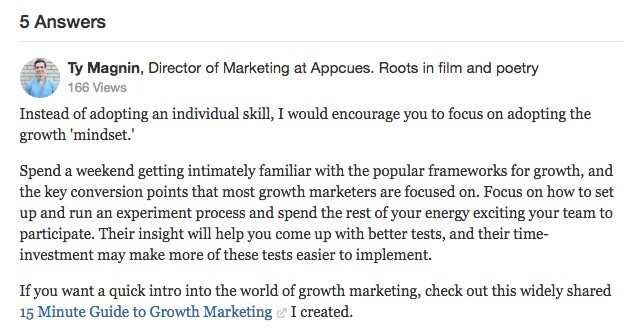 Brian’s view on growth is very similar to mine, and his insights are always spot on. I share information from Coelevate regularly because most Insiders aren’t following Brian and other growth gurus. Rather, they’re deep in their own industries, and they rely on me to bring them the latest, most relevant growth and marketing information. Content that truly can make an impact on growing a team’s knowledge or skill set as it relates to growing the organization. Your users probably aren’t following the leaders in your industry. They’re counting on you to go deep and bring them the latest, most relevant information along with the analysis and context that you can provide by virtue of your expertise. Of course, as with everything you do, you want to ensure that your focus is always on – say it with me now – creating an amazing buyer experience throughout your entire funnel. Right. I know that I’ve said it already, but in the context of content curation, this means curating content that provides real value for your users, as Heidi Cohen explains – not for search engines, and not to make you popular with influencers. Are search engines and influencers important? Of course, they are. But your users are more important, and if you focus on providing real value for your users , day after day, the search engines and the influencers will catch on. On the other hand, if you spend your time chasing Google’s ever-changing algorithms and trying to curry favor with the big names in your industry, you’re not helping your users or yourself over the long term. The content you create for your blog isn’t the same as the content you create for, say, Pinterest and the same principle applies to curated content. Ideally, you need to optimize your curated content for each channel so that it resonates with and engages your users. What makes curated content meaningful is how it is presented, by whom it was curated and the context for why it was chosen. 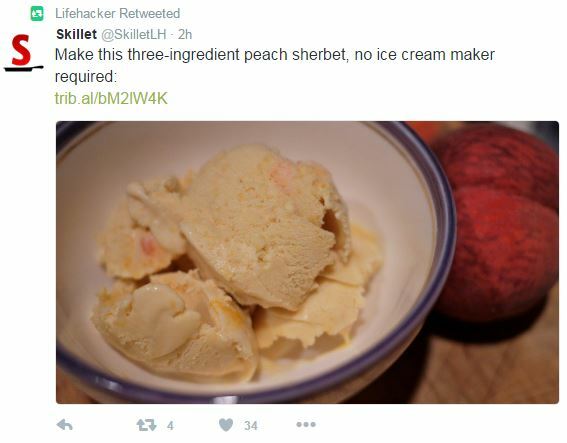 Look at how Lifehacker shares the same content on Twitter and Facebook. On Twitter, we get a simple statement and a link to the explanation. Facebook hits us with a bit of humor or personality and a preview of the article. Different channels attract different users. Bear those differences in mind when you choose which content to curate and share on individual channels. Aim to give your users the context and insight they need to fully understand the content you’ve chosen to share. By the way, I know that you already know this, but it bears repeating: be an ethical content curator. Leon Kaye recently wrote about how writers and videographers are tired of having their content and ideas stolen by Buzzfeed. Curation is not about stealing another site’s traffic. 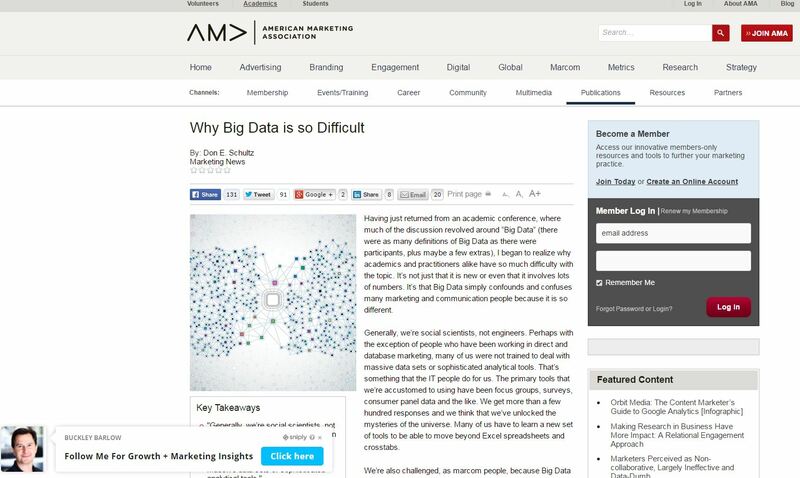 It’s about driving traffic via well-placed links and giving attribution. Never use an image without permission, never plagiarize someone else’s words. Content curation is not stealing. It’s sharing – and giving credit where credit is due. Check out the Curator’s Code – the brainchild of Maria Popova, a curator extraordinaire – for an interesting take on how to standardize attribution across the Internet. Ok, I realize that to deliver a personalized experience with every channel is rough on small businesses and entrepreneurs. It’s just one more thing you have to remember to do along with 1000 other time-consuming tasks; you simply don’t have the time to do it all and I get it. I hear it all the time and I know exactly how you feel. Just know this: These little things do, in fact, matter, as you want to grow or scale your business. Whether you want to lower your attrition, increase your onboarding and retention metrics, the devil of incremental (or even rapid) growth is in the details. How’s this for meta: I’m going to give you a small curated list of easy-to-use (and free) content curation tools and resources. I don’t want to throw a list of links to 57 amazing resources for content creation at you, because, well, that’s not curation. I don’t want to just copy and paste the features and benefits you can find on any Google search because that’s not giving you the context and value you deserve. Instead, I’m going to highlight a handful of content curation resources and tools I use each day to search and evaluate content. I’m going to briefly touch on each one and why it has earned its place in my life. When I’m looking for interesting and relevant information to share, I often turn to Quora. Think of Quora as your own personal fountain of knowledge. Users submit questions, which are answered by experts and authorities – as well as ordinary people who have experience in a given topic. And all of those answers are ranked and archived, to be searched by anyone later on. Chances are highly likely that your question has been asked and answered, and you will undoubtedly find high quality, original content you can share with your audience. 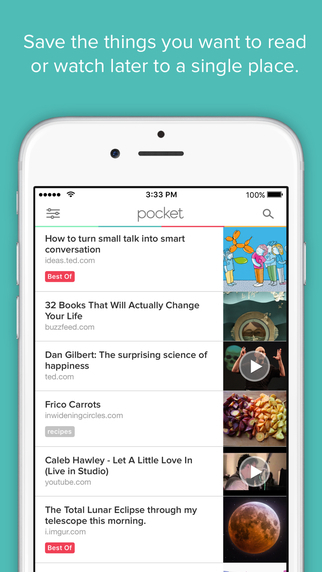 Pocket makes it easy for me to save and tag relevant content so that I can share it with Insiders later. With a free Pocket account, you can save content – articles, videos, podcasts, and whatever else you come across online – from your phone, tablet, or computer, and everything you save is accessible from any device. Once you’ve saved something to Pocket, you can also view it offline, which means I can review a stockpile of content during a flight, tag the things I want to share, and then set up the sharing when I’m back online. Pocket also integrates smoothly with just about any app, browser, or device you can think of, so saving content happens with a single click. Flipboard is a handy little app that aggregates various forms of content based on categories you determine. Much of the content I come across on Flipboard doesn’t get shared, but for the occasional gem that I find, I’m willing to put in the time on a regular basis. You can create custom boards to sort your content – think Pinterest, but with a focus on text rather than images – and follow other users who are saving content that interests you. I like Flipboard for the variety of content that it pulls in as an aggregator; with the right setup you can find and share content that your audience hasn’t already seen somewhere else. This recording of a webinar from Jessica Rosenberg and Jenn de La Vega explains how to use Flipboard to grow your audience and influence, and how to use the platform for research and inspiration. Storify was created by an incredibly forward-thinking group of people who believe in the power of the social newsroom. It’s a great tool for weaving together all sorts of information socially, like news reports, tweets, Facebook updates, pictures from Instagram, and videos. Like many content curation tools and resources, Storify does a great job with the content aggregation process – that process of collecting as much relevant content as possible. But where the app really shines is what you can do after you have the content. Once you have all the aggregated content from the various social media accounts, the interface allows a curator to create a collaborative storyboard via an enormously easy drag and drop interface in true storytelling fashion. In the graphic above, notice the Twitter button I’ve selected with a search term of “SEO”. Below the search bar is loads of aggregated information under the term SEO and as a curator, I can simply drag what I find useful to my audience to the editor on the left side of the screen. For the novice content curator, the concept and application of Storify may be a bit quirky to wrap your head around initially, but like most powerful apps, the more you use it, the more value you will get from it. Think SnapChat Memories for business social content and you’re getting close. With Sniply, anytime you share content with your audience, you can overlay that content with your own custom call-to-action. 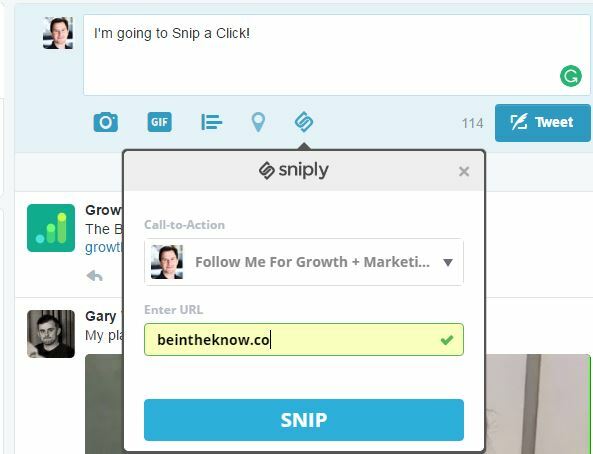 Sniply creates a custom short URL that lets you track engagement and see exactly which content resonates with your users. Here’s an example of how I use Sniply to share content on Twitter. In Twitter, for example, I simply add the message that I want to share, click the Sniply icon, associate the Call-to-Action and Enter my URL that I want to share. After that, I simply press the Snip button to get my new link. Now, when a user clicks on that link I shared in Twitter, users will see in the lower left-hand corner of their screen, the person (me in this case) who curated the link along with an associated message or call-to-action. Mike and his team did an excellent job on their product and I am effusive (all the time) over their app and team! Beyond curating content for your own audience, another application of content curation that gets me excited is curated learning paths, for which In The Know is known. We learn more – and better – when information comes from sources and people we trust. Curated learning paths provide learners with information that has been vetted and gives users the proper context for that information, which significantly reduces the learning curve. When you don’t have to waste time and energy convincing yourself of the value of the material, you can focus completely on mastering it. At In The Know, the curated content is presented in a contextual, logical and advancing sequence of learning, called a Learning Path, which allows users to master a topic in small, sequential steps. This approach to learning is rapidly becoming adopted as an effective solution when a learner needs to absorb a lot of information on a certain topic in a short amount of time. 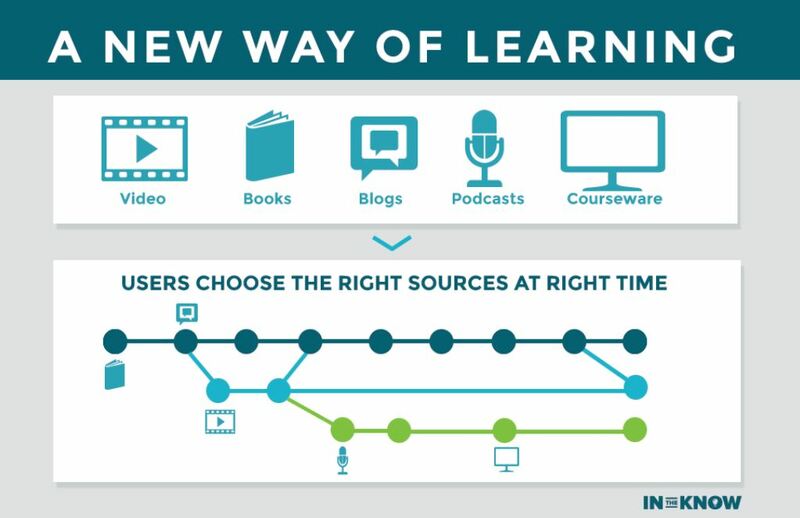 Unlike rigid learning paths (where content is locked until you complete a prior step) or styles of learning which are very one-way (a boring college lecture), an unlocked, highly flexible learning path adapts to accommodate various learning styles, including audio learners, visual learners, and more. 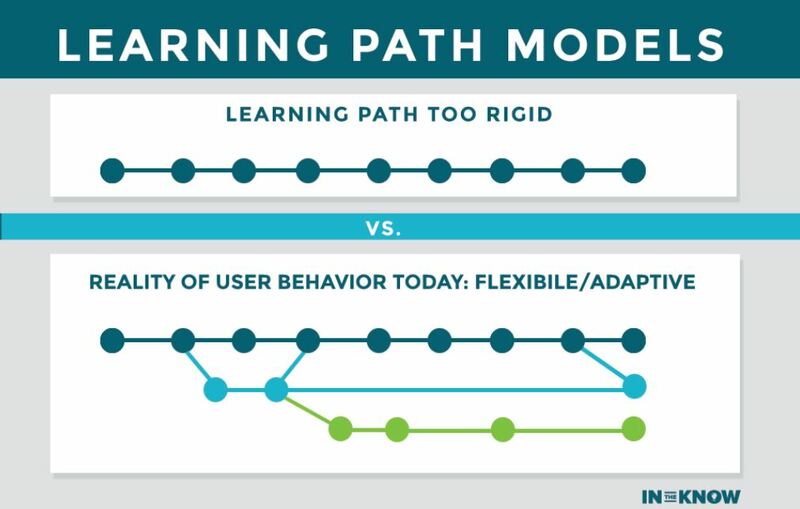 Ultimately, with that flexible path, the learner retains control over the best way for him to learn from the content – how quickly or slowly he will progress through the material; the order in which to consume the learning path; which learning style he prefers (blog, video, podcast, courseware, in-person events, etc.). As far as I’m aware, In The Know is the first site to launch curated learning paths that cater to multiple learning styles in an evolving open pathway and provide the critical context necessary to engage learners. In fact, we might even be the only site doing this right now. If you know of another one, would you let me know? The curated learning paths at In The Know are designed to get you – forgive me – in the know and keep you ahead of the curve by providing information people actually use on the job. For example, take a look at the Conversion Optimization learning path. 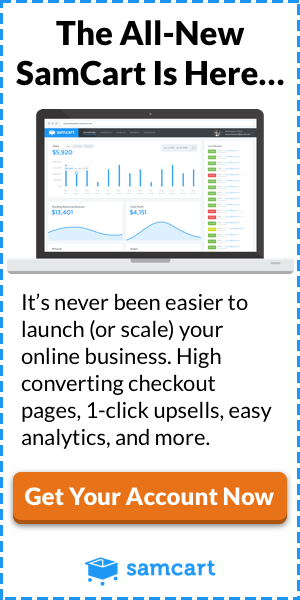 It shows you the tools you’ll actually use to do conversion optimization, and how to use them in addition to providing the background information and theory of how conversion optimization works. The idea is to close the skills gap that so many companies are facing today. By the way, I’m not the only one who sees the value of innovative curated learning paths (thank you Robin Good for all of your awesome work). 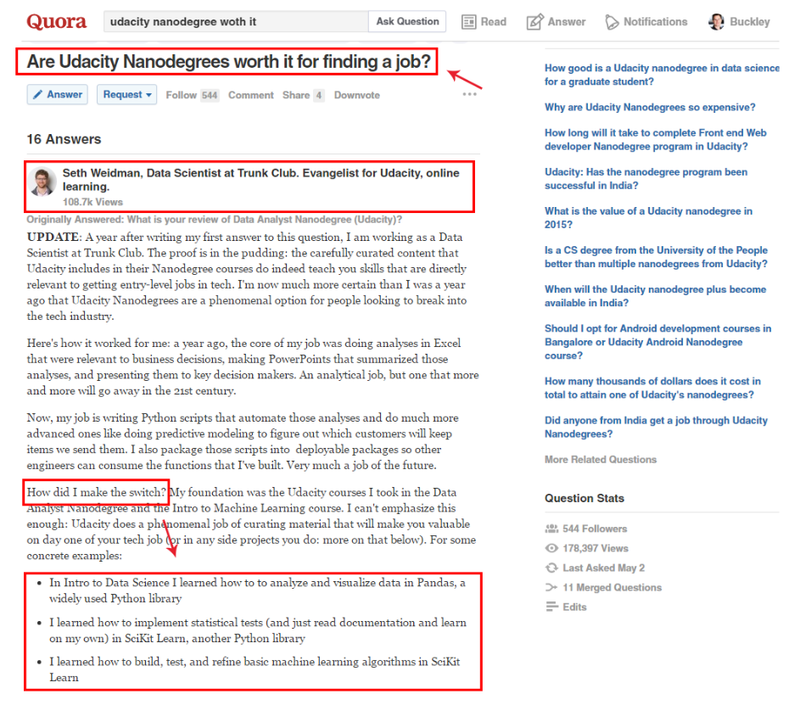 Udacity has put an enormous amount of brainpower (not to mention money) into what I see as a form of curated learning with their content partnerships with Google, Lyft, and other companies. The Udacity Nanodegree is already making waves as a game changer – it’s closing the skills gap and providing people with a reliable, straightforward way to get the skills they actually need to do their jobs and they are bringing in other companies content to enhance their education programs. Does it work? The students who have enrolled seem to think so. 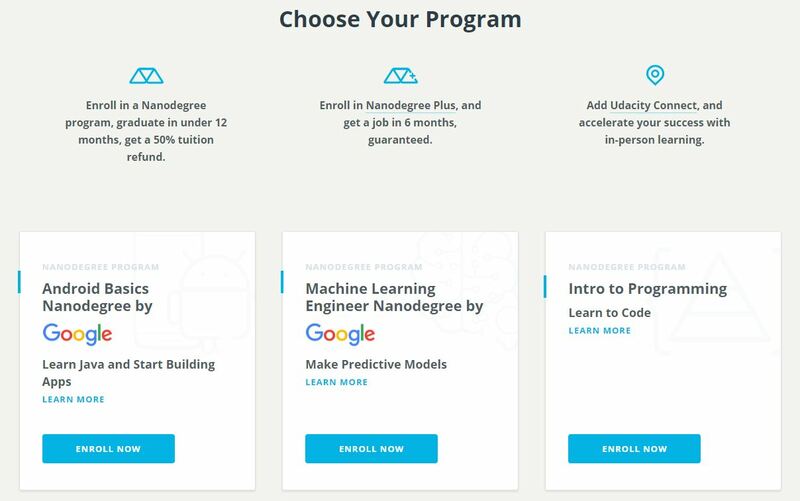 Udacity’s Nanodegree Plus program even guarantees students a job within six months – or a full tuition refund. In case I’ve failed to drive this point home, the value of content creation comes from providing context that keeps your user’s needs front and center. 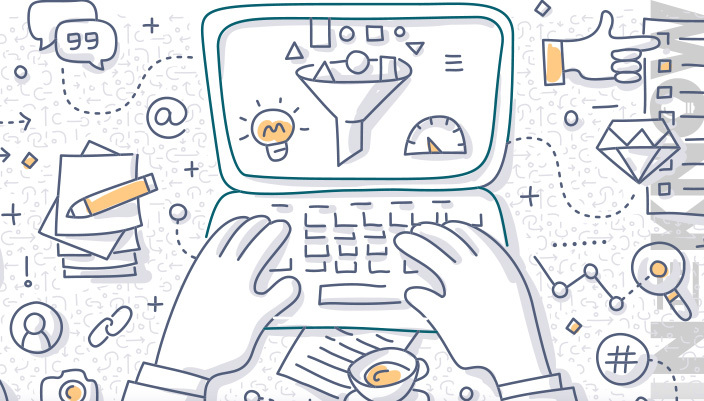 You can – and should – use curated content through every stage of your marketing funnel. It’s a time-consuming process, to be sure, but far less time-consuming than creating copious amounts of original content. Even better, when done correctly – that is, when you take the time to provide the necessary context for your users – content curation can make for an absolutely incredible user experience and drive more eyes to your original content. When your curated content is carefully chosen for the value and service it provides your users, they will notice. In addition, content curation can add overall value to your marketing program by helping you establish relationships with other content creators. When you curate content ethically and help drive traffic to the original authors, they will notice – and they will often reciprocate. When you choose to invest in content curation as Nate Birt at ScribbleLive aptly sums up, you’re making an investment in your users, and in your relationship with them, as well as investing in the quality of content you provide. So, to wrap this post up, if you want to develop a top notch content strategy, you ought to work on implementing content curation into your strategic mix. Give this a try! I promise it won’t hurt (It will actually feel great as it’s a heck of a lot less painful)! As I’ve hammered home, when you take the time to curate high-quality content, you can significantly increase the amount of content you provide to users – and improve their overall experience – without having to create all of the content yourself. Done well, curated content can be a very valuable and high returning segment of a comprehensive content marketing strategy. Hi, Buckley Barlow! Great post as always. Question: If I want to start a curation site, is it better to be both a content aggregator and a curator, or just a curator? Hey Amelia, I’ve seen sites do both and sometimes it works very well. If the value is there and users love it, great. On our site, we produce original content coupled with curated content through our learning paths. It’s a nice mixture that many people love and our traffic is growing every day. I can tell you, however, that aggregating content through 3rd party apps is a lot EASIER than creating original long form content (like we do at In The Know). Best of luck. I was looking for something like this and finally I found it here in your post, while reading it I realized that it’s an excellent coverage of the whole content curation thing and the way you have explained it is a great way to manage content which you are curating and for whom you are curating. Nowadays, people prefer more quality content instead of quantity content, so yes we have to make sure whenever we write something it should be more informative and add value to them because lots of people like it only if it’s on a very interesting topic. I am definitely going to put this into action today. Keep sharing such informative posts as they actually help. Excited to see your next post. Hi Buckley! Thank you for this awesome and very detailed post about content curation. This will surely help a lot of people wanting to curate content. Grant, thanks for the comment. Hope it helps. Great overview Buckley! Content curation is not a new aspect. Museums and galleries also have their curators to select items for collection and display. In fact, there are curators in every field in the world. Content curation can be used either manually or automatically or by the combination of them. But it depends on us when and which method is useful for our business. Whatever source of content or method of content aggregation we choose; content curation will save our time, money, and effort. We can also consider it an important part of our content marketing strategy. According to you which method of content curation is better manual, automatically or the combination of them? Well, like I had mentioned in the post, you have to first aggregate the data and then you manually have to go through and read every single piece that you are wanting and willing to share to your audience. On top of that, the context from your perspective is the most powerful part about curation, especially if you have built a level of trust and credibility with your audience. So, I use a combination of automatic filters and aggregators and then I personally select the content that will resonate with my audience. I hope that helps. Great article! 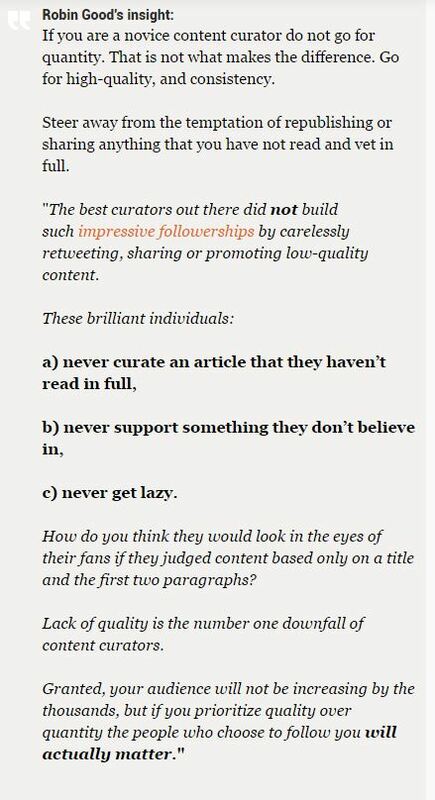 It articulates well why content curation is important and the many ways it can be used. Specially for beginners what I think is there is no hesitation in expanding the content which is already written by someone with different thoughts and perspective. Instead of taking a completely new topic you can take a quality content and expand it. What do you think this will work? Joseph, not sure I understand the question? Buckley, I was asking about the idea which I have written in the comment above for beginners that is = Instead of taking a completely new topic can we take a quality content and expand it? Absolutely. You ought to check out Brian Dean’s skyscraping method. Use that method in conjunction with curation and you have a winning formula. We never miss a single post on this blog to supplement to our technical knowledge about other platforms.